sursilvan (help·info); derived from the name of the Surselva-region, which itself is derived from sur 'above' and selva 'forest') – spoken in the Vorderrhein (Rain anteriur) valley, including the Lumnezia, Foppa, and Cadi. It is the most widely spoken variety, with 17,897 people within the Surselva region (54.8%) naming Romansh as a habitually spoken language in the Swiss census of 2000.
putèr (help·info); probably originally a nickname derived from put 'porridge', meaning 'porridge-eaters'.) – spoken in the Upper Engadine valley (Engiadin' Ota) west of Zernez. 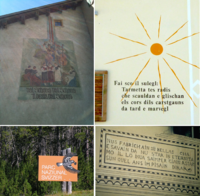 Romansh was named by 5,497 people within the Upper Engadine valley (30%) as a habitually spoken language in the census of 2000.
vallader (help·info); derived from val 'valley') – is spoken in the Lower Engadine valley (Engiadina Bassa) and the Val Müstair. 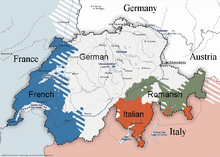 It is the second most commonly spoken variety of Romansh, with 6,448 people in the Lower Engadine valley (79.2%) naming Romansh as a habitually spoken language in the census of 2000. As these varieties form a continuum with small transitions from each village to the next, there is no straightforward internal grouping of the Romansh dialects. The Romansh language area can be described best as consisting of two widely divergent varieties, Sursilvan in the west and the dialects of the Engadine in the east, with Sutsilvan and Surmiran forming a transition zone between them. The Engadinese varieties Putèr and Vallader are often referred to as one specific variety known as Ladin (rm. ladin (help·info)), which is not to be confused with the closely related language in Italy's Dolomite mountains also known as Ladin. Sutsilvan and Surmiran are sometimes grouped together as Central Romansh (rm. Grischun central), and then grouped together with Sursilvan as "Rhenish Romansh" (in German, "Rheinischromanisch"). chasa (help·info) 'house'. Overall however, the Central Romansh varieties do not share many unique features, but rather connect Sursilvan and Ladin through a succession of numerous small differences from one village to the next. cudisch (help·info) 'book'. It is regarded as either a marginal phoneme or not a separate phoneme from /u/ by some linguists. schenghegiar 'to give a gift', Put. ⟨r⟩ [r] or [ʁ] Put. ⟨y⟩ (Depends on pronunciation in original language) Vall. ⟨ei⟩ [ɛi̯], [ai̯], or [ɔi̯] Surs. Raetic: gnieu (Surs. igniv; Suts. (a)gnieu, ugnieu; Surm. nia; Put., Val. gnieu; Jauer agnieu) 'nest, eyrie', ampauna (Surs. puauna; Suts. omgia, ontga; Surm. omgia; Puter ampa; Val. amp(u)a) 'raspberry', izun (Surs. izun; Suts. (n)izùn; Surm. izung; Put., Val. uzun; Jauer anzola) 'bilberry', chamutsch (Surs. camutsch; Suts., Surm. tgamutsch; Put., Val. chamuotsch) 'chamois', crap (all dialects) 'rock', gonda (Val.) 'scree slope', grip (Surs., Suts. grep; Surm. crepel, crap; Put., Val. grip) 'cliff', grusaida (Surs. grusaida (help·info); Put., Val. grusaida) 'snow rose', panaglia (Surs. panaglia (help·info); Val. panaglia) 'butter churn', schember (Surs. schiember; Suts., Surm. schember; Put., Val. dschember) 'Swiss pine' (< *gimberu < Raetic *𐌊𐌉𐌌𐌓𐌖 (*kimru, *gimru). ), signun (Surs. Celtic: carmun (Surs. carmun) 'weasel', dischariel (Surs. derschalet; Surm. darschalet, ischier; Put., Val. dischöl) 'goblin, nightmare', draig 'sieve', glitta (Surs. gliet(ta)) 'silt, mud', grava (Surs. grava (help·info); Val. grava) 'scree', mat 'boy' ~ matta (Surs., Surm., Put., Val. matta; Suts. mata) 'girl', mellen (Surs. mellen (help·info); Surm., Put. mellen; Suts. melen) 'yellow', tegia (Surs. tegia (help·info); Suts., Surm. tigia; Put. tegia; Val. teja) 'alpine hut', trutg (Surs., Suts. trutg; Surm. trotg; Put. truoch; Val. truoi) 'footpath, drove way', tschigrun (Surs.